I have a confession to make. Sometimes I'm not brave enough to wear my own bisexual pride t-shirts. As I've mentioned before, I'm not out to everyone in my life. I firmly believe in bisexual visiblity and representation, but for me coming out is not something that happens just once and then it's done. It's a decision I make day-by-day, interaction-by-interaction. Those moments I decide to be out with new people are incredibly inspiring. I find people are more free to be themselves when I model that behavior. I develop deeper connections with people and I love it. 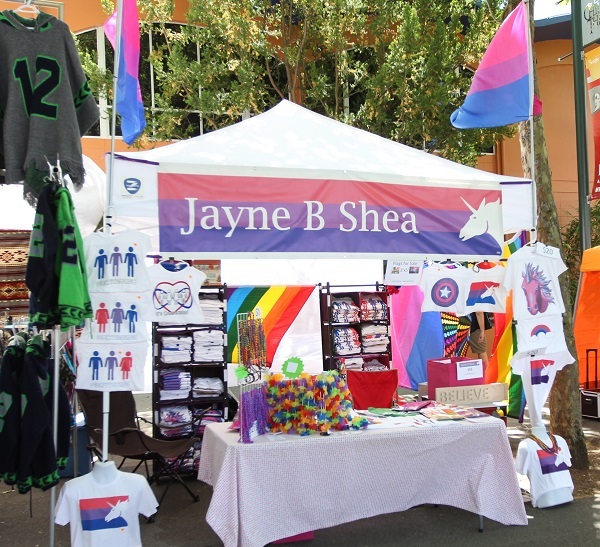 Even something as simple as wearing a bi pride t-shirt can spark a conversation and a connection that would not have existed otherwise. But some days, or in some contexts, I choose not to make my sexuality visible. And as frustrating as that may be to some champions of our cause, myself included, I am here to tell you and to remind myself: THAT IS OKAY! Because here's the thing: selective visibility is self-care. The moments where I give myself permission to not be out make it more likely that I will do so when I'm feeling more comfortable. And I know from my experiences over the past few years that when I do let my bisexual pride shine, it is a beacon of hope and comfort for others in this community. And that is the best feeling of all.